For use with 5,000 LB. 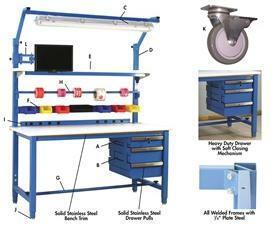 Capacity Kennedy Series Workbenches. Many optional accessories are available to customize your workbench, please see the chart below. Optional earthquake safety light fixture, Bin-Box Rails, Roll Holders and Shelves snap onto slotted uprights. Drawers come with 100 lb. capacity soft closing Full Extension Heavy Duty suspensions. Electrical options are UL Listed. Advanced function light fixture includes two T8 bulbs, integral switch, 10’ cord, electronic ballast and clear acrylic defuser. Sealed against dust and other airborne particulate. FOB Shipping Point. Overhead Light - Includes two T8 Bulbs and a rust, dust, moisture and explosion resistant fixture with switch, the deluxe mounting frame and 10' cord. 48 x 60" benches use 4' fixture. 72, 96 and 120" benches use 6' fixtures. To order these colors, add a SKU to your cart and indicate the desired color in the comments section. Ask about quantity discounts and hundreds of other options! See Related Items tab for 5,000 Lb. Capacity Kennedy Series Workbenches - with Butcher Block Top, 5,000 Lb. 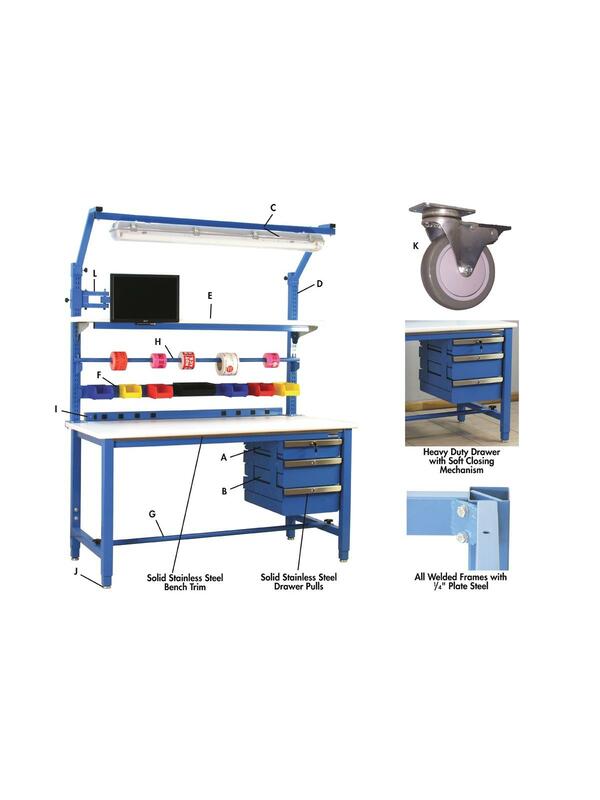 Capacity Kennedy Series Workbenches - with Stainless Steel Top, 5,000 Lb. 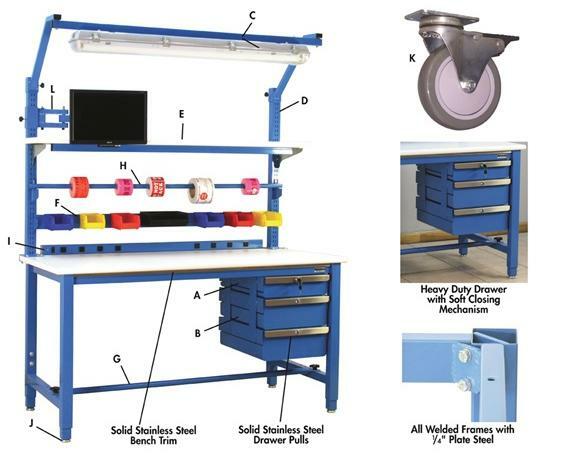 Capacity Kennedy Series Workbenches - with Heavy Formica™ Laminate Top, and 5,000 Lb. Capacity Kennedy Series Workbenches - with Heavy Lisstat™ ESD Top.